GURUS AMPS Are the Italian creators of award winning pedals like Echosex 2° and the 1959 DoubleDecker. We want to continue making some of best used machines of the past available today to musician. Our product creations will have some new added features to make it current and help todays musicians be more creative. 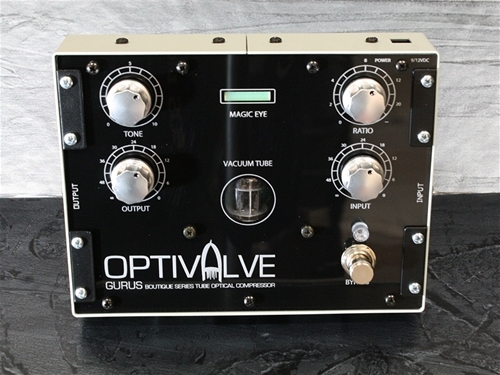 The OPTIVALVE Tube-Optical Compressor Pedal is the last word in Compressor Pedals with all the advantages of the legendary Studio Outboards that have made history in music, but more versatile and easier to use. Use it in different ways as a studio outboard, or on your pedalboard. As a standard compressor pedal to bring out the tone suitable in various styles: funky, blues, rock, etc. Use as a Limiter, to obtain maximum clean volume from your Amp without adding crunch it, or as an incredible enhancer of your TONE. Use the “See thru Magic EYE” to view the Compression reduction level. Use it with your Guitar, Bass, Keyboard, Acoustic Guitar, or as real outboard for your mixing tracks. Power In 9 – 12 VDC max. Input Level 1 Vpp max. Tone filter - 6db @4500Hz.